The obligations of a supplier of a substance or mixture depend upon his role under CLP. Please identify your roles in the supply chain and your obligations in the following table. - ECHA has indicated in its FAQs that if you missed C&L notification deadline, you shall notify without any delay to avoid legal penalties. You can avail of our CLP notification service by using our application form. - should submit a proposal to the Competent Authority if you have new information which may lead the change of harmonized classification and labeling. - shall provide Safety Data Sheets(SDS) along the supply chain and update SDS when necessary. - should take over the classification for a substance or mixture already derived by another actor in the supply chain in accordance with Title II of CLP , for example from a Safety Data Sheet. Note: Non-EU companies and REACH only representatives do not have direct obligations under CLP regulation. However, non-EU companies might be required to provide the latest Safety Data Sheet according to REACH & CLP or submit C&L notifications for each of its importers. The most urgent thing for EU importers/manufacturers of chemicals at the moment is to submit C&L notifications before 3 Jan 2011. If you are a non-EU company and your importers have requested you to submit C&L notifications, we may also submit C&L notification in the name of your EU importers and acquire C&L notification number for them. CIRS also offer CLP compliance package price (notification+SDS+label) from 300 Euros per substance. 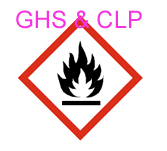 We also prepare Chinese MSDS and label in accordance with China GHS.